If you want to be an architect, you have to speak in a certain way; if you don’t, no one will take you very seriously. Architects tend to be overly specific and use words rarely uttered by regular human beings during normal conversations. In fact, 62% of all the words that come out of an architects mouth could be replaced by a simpler and more widely known word. Once you have decided that you do in fact wish to be an architect, you have to accept that there are words that you are simply going to have to learn. These words by design will obfuscate the listener (by the way, I could have said ‘confuse’ instead of ‘obfuscate’ but that is precisely the point here). Let’s get things start shall we? I have come up with a list of designer-y words that you need to master. Once you have managed to work these words into your daily conversations without effort, you’ll be on your way to becoming a bona-fide architect. At this point, you should expect your commissions to increase – or if you are still in architecture school that your grades will improve. You will discover that people will stop listening to you and just accept that the words coming out of your mouth are awesome and righteous … the listener will not want to expose the fact that they don’t understand the word that you are using in such a common and cavalier manner. Once you have reached this point, the real secret is that you can start making up your own words and people will be forced to believe you. This is a riff on the story ‘The Emperor’s New Clothes” and architects have been making use of this technique for decades. hierarchy: a system of elements ranked, classified and organized one above another, according to significance or importance. While you are learning and practicing your new vocabulary words, take the form along with you next time you are sitting in a design presentation and mark off the words as you hear them. Feel free to submit your own architectural vocabulary words for consideration in the comment section below. 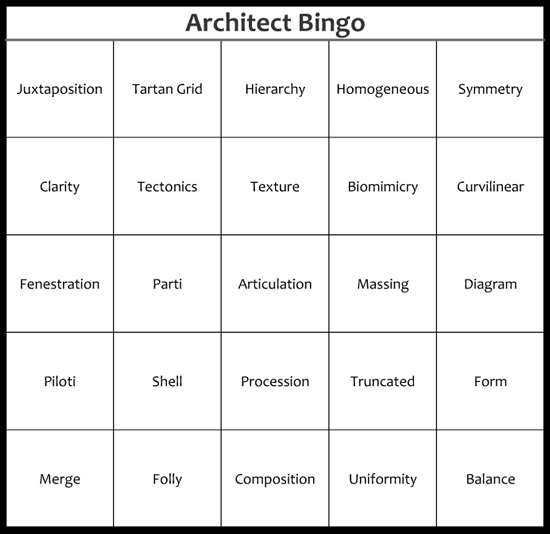 I’m pretty sure that we can come up with a full set of ‘Architect Bingo‘ playing cards so that you and all your friends can play along at the same time.